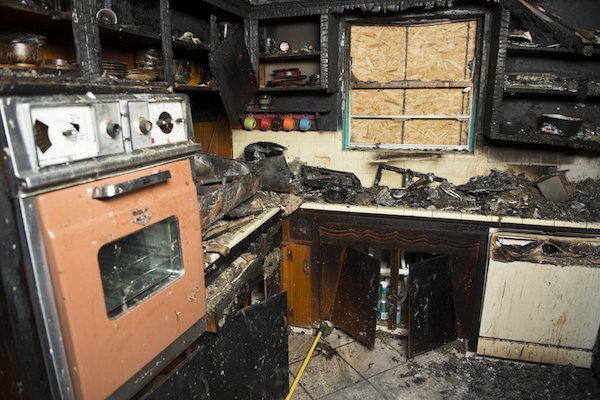 The kitchen might seem like a safe place to be, but fires can occur quite easily in them if you are not careful. Most kitchen fires can be attributed to cooking food on the stove or using some other form of cooking equipment. Some people might buy pressure cookers or devices that plug into the wall to cook their food. If you don’t watch this equipment carefully as they’re cooking your food, then the heat could easily start a fire in a number of different ways. Fire damage can be extremely hard to repair as well. If you’re running a restaurant or some other business that uses a kitchen, then you’ll probably have workers in the kitchen. But if you are cooking in a home kitchen, you might tend to walk away from your food while it is cooking. This can be a dangerous habit because if a fire starts, you may not notice until it has spread throughout your kitchen. Always check on your food and stay near it no matter what. This includes when you’re grilling, boiling, broiling, simmering, roasting, and even baking. If too much smoke comes out from your cooking equipment, then lower the temperature or turn it off immediately. In case there is a fire, you’ll want to have a fire extinguisher on hand so that you can put it out quickly. This is quite standard in commercial establishments, but not so much in homes. But a fire extinguisher may be the only way to save your home from getting destroyed if a fire were to spread quickly in your kitchen. You can purchase a fire extinguisher at most home improvement stores. Any gasoline or other flammable liquids should be stored in a cool location when you are not using them. A lot of people like to store them in their garages or basements. As long as it is a dry location, then it will be safe to store the liquid there. Keep all matches, lighters and other heat sources away from this area. 4) Call the Police and Run! If you are unsuccessful in putting out a fire and there is smoke that begins to build up too much in your building, then don’t stay around anymore. Get outside as fast as you can and call the police. Otherwise, you could potentially experience smoke inhalation poisoning or fire burns if you stay around too long.